Through their innovative vertical gardening products, Foody Garden Towers aim to provide the world with sustainable food solutions that improve our quality of life, protect the environment and secure our future. If cities produced just ten percent of the ground crops they currently consume, by employing sustainable indoor vertical farms and greenhouses to do so, then nearly half of the damaged portion of the Brazilian rainforest could theoretically be restored (340,000 square miles worth) and a significant amount of carbon would be sequestered as the result. By just producing 10% of what they consume, cities could amazingly eliminate a huge portion of their carbon footprint. 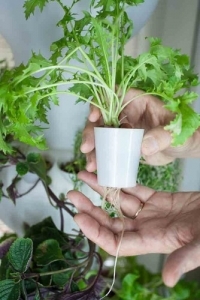 Companies such as Foody Towers are helping this number become a reality by providing products that promote sustainable gardening methods with limited space and resources needed. These towers are also easy to setup, take down and replant when needed. The Foody system consists of stackable pods, containing 12 removable “net pots”, which require no soil. 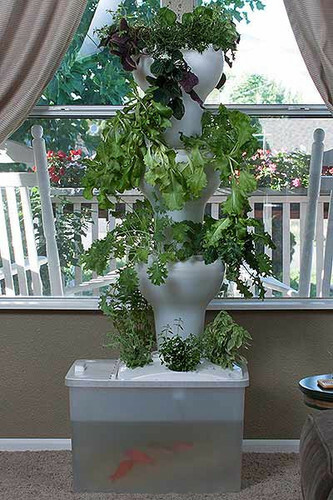 This easy-to-use, indoor/outdoor garden system allows the user to grow their own fruits and vegetables either hydroponically or aquaponically. meaning from the Greek language-ὕδωρ (hudōr)- which literally means water culture. Unlike other subsets of hydroculture, hydroponics uses mineral rich solutions to aid the development and robust growth of plants and vegetation. There are two main types of hydroponics: solution culture and medium culture. Solution culture strictly uses nutrient solutions and does not use a solid medium for the roots, whereas medium culture uses various solid mediums such as hydroton (clay balls that have been kiln dried), rockwool, or coconut fiber for the plant roots. The Foody 12 demonstrates just how effective and sustainable growing plants hydroponically can be. This Foody Tower can grow up to 56 plants in a little more than two square feet of floor space while encouraging rapid plant growth by circulating nutrients and water directly through the plant roots. As the name suggests Aquaponics cultivates food through the combination of aquaculture and hydroponics. This method incorporates aquatic animals into the cultivation of plants in water. It is highly environmentally friendly and extremely productive. Aquaponics entail using the byproducts produced by fish kept in a tank to feed the plants with the nutrients they need to grow. The excretions from the fish lead to increased ammonia in the water which becomes deadly to the fish unless removed. Added bacteria help the nitrification process and turn the ammonia into useful nitrates for the plants to absorb. The plants in turn help clean the water for the fish. Aquaponic systems such as the Foody 12 do not typically discharge or exchange water under normal operation, but instead recirculate and reuse water very effectively. Foody Towers are paving the way for a more sustainable future. Companies such as Microsoft have jumped on board with Foody Towers to alleviate some of their environmental impact in the work environment. We would like to see how these develop in the future and incorporate other renewable energy resources into the food growing process. Was Tom Brady On Something When He Laughed Off Tampering Allegations?